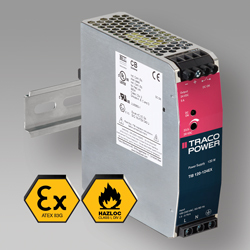 TRACO POWER has released their TIB 120-EX Family of 120W DIN rail power supplies that are created for harsh environments and hazardous locations with certifications for ATEX II3G and UL HazLoc Class I/Div 2 standards. These products are the new forefront of industrial power featuring: 12/24/48V outputs (-2% ~ +17% VADJ Range); high-efficiency operation of 94%; 150% peak power for four seconds; and packaged in a ruggedised metal enclosure that is EN61373 qualified for railway shock and vibration. Protection circuits cover back power immunity, short-circuit/overload protection and a DC OK dry signal contact. DC-OK LED indicators on both the front and side panels with arbitrary side panel mounting allow use in flat panels. The product’s decreased heat dissipation enables a -40C to +60C full load operating temperature range (up to +70C operation with only 20% de-rating). Outputs are radio-interference-suppressed to impede radiation at long output lines. This filter decreases the common mode current to within limits of telecommunication ports. The units work with a high power factor of up to 99% with active power factor correction which also reduces input inrush current. All models are safety approved to satisfy UL/EN 60950-1, UL508 listed, EN 600079-0/-7/-15, ATEX II3G and UL HazLoc Class I, Division 2 with EN55032 Class B for both radiated and conducted emissions. High reliability of greater than one million hours per IEC 60079-0 is supported by the company’s extended five year product warranty.